You are here: Home / MAIN COURSE / Gouda Cheesy Shepherds Pie! Cook once, eat twice. Gouda Cheesy Shepherds Pie is great to eat now and freeze some for later when you’re too busy to cook. Cheesy potatoes, warm and flavorful beef in every bite this comfort food recipe will be a family favorite! I feel it starting…., the time of year when you have a million commitments. You’ve barely put away the dishes and decorations from Thanksgiving and the Christmas cards are in your mailbox which reminds you you have to start working on those. The party invitations start coming in too. Christmas presents to buy and shopping will take away precious time. I like to be prepared for when I know there won’t be time to cook…. so earlier in the month…. LIKE NOW, I make today’s recipe for Gouda Cheesy Shepherds pie. It’s a great meal to make a double or triple batch and freeze the leftovers for when you have been out shopping and have no time to plan meals let alone make them. It’s an all around winning meal because its 100% comfort food for now, then again when you serve it later in the month. 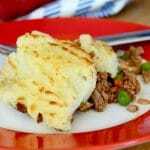 We love Shepherds pie and in the United States Shepherds Pie is made with either ground beef or ground lamb. 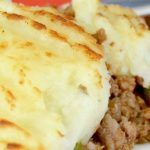 But if you are ordering this in England you will get ground lamb if you order Shepherds pie, but if you want Ground Beef you’ll need to order Cottage Pie! The Gouda Cheesy Shepherds pie is a twist on traditional shepherds pie with the addition of the cheese in the potatoes! You can substitute your favorite cheese if you don’t happen to have any Gouda! I mean look at this crunchy cheesy topping on this? If you’re looking for other comfort food recipes that you can freeze for later you can also check out this Smoky Jambalaya or this Pulled Pork! Cook once, eat twice. Gouda Cheesy Shepherds Pie is great to eat now and freeze some for later when you're too busy to cook. Cheesy potatoes, warm and flavorful beef in every bite this comfort food recipe will be a family favorite! In a large skillet melt butter and olive oil on medium heat. Once melted, add onions, carrots, celery and garlic and saute until tender, but not mushy. (they will continue to cook in the oven when baking, so you want them to be al dente... almost completely cooked, but not mushy.) About 7-8 minutes. Once the beef is browned, add the worcestershire sauce and the beef broth and cook for another 10 minutes. Check seasoning at this point and add salt and pepper to taste. Add peas and corn and mix well. Using an oven proof backing dish for the next cooking, place the beef mixture evenly across the bottom of the pan. I use an 9X13 glass dish, but Ive split into smaller pans as well. 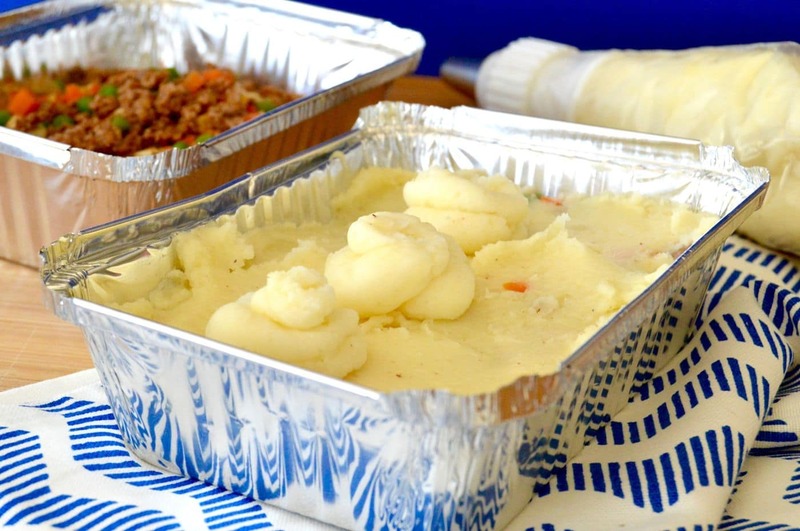 Make sure the potatoes are completely covering the meat mixture and there are no open spaces against the baking dish. While it will still be very tasty, if you have an open space, the meat juices will seep out while baking. You can run a fork across the top to get crevices that will get crunchy in baking. Place in oven and bake for 20 minutes or so or until golden brown. See Notes for Freezer info! 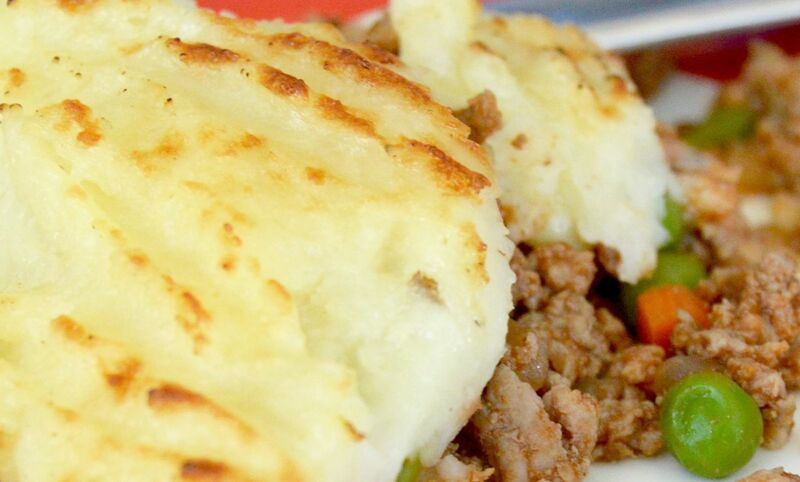 Just a fun fact, technically Shepherds Pie is made from Ground Lamb and Cottage Pie is made from Ground Beef. But in the United states we use the word Shepherds pie interchangeably for both! When ready to make the freezer version you will need to defrost for 1-2 hours before baking. I take them out and place them in the fridge the night before and they are ready when I want them for dinner. Calorie information for this recipe was calculated in My Fitness Pal using the ingredients/brands I used to make this recipe. Please note using different brands can alter the caloric information. Please keep this in mind if you are following strict dietary guidelines. (NOTE: Potatoes are included in the recipe calorie information). PLEASE NOTE THE RECIPE INCLUDES THE MASHED POTATOES IN THE CALORIE COUNT. Add potatoes to a stock pot and cover with water. Bring to a boil and let cook for 20 minutes until tender. Once cooked, drain potatoes and either mash them in the pot or run them through a potato ricer and place them back into the pot. Calories for this recipe card are for the potatoes only in case you are using them for a side dish (thus 16 servings) The calories for the shepherd's pie includes the potatoes in the recipe as well. « Leftover Stuffing Bacon Cups: Creative Leftovers! Just made these cheesy potatoes… going to keep these In the rotation. Do you think I could use a pepper jack cheese? This looks fantastic! Great pictures! The lamb would really make this a rich and delicious dish, and I’ll be making those potatoes! I made them on Sunday and John went goo goo! Wow! Deluxe comfort food. The cheesy topping has stolen my heart. Gouda makes everything better doesn’t it! I love the cook once, eat twice idea. It’s perfect for this time of year. 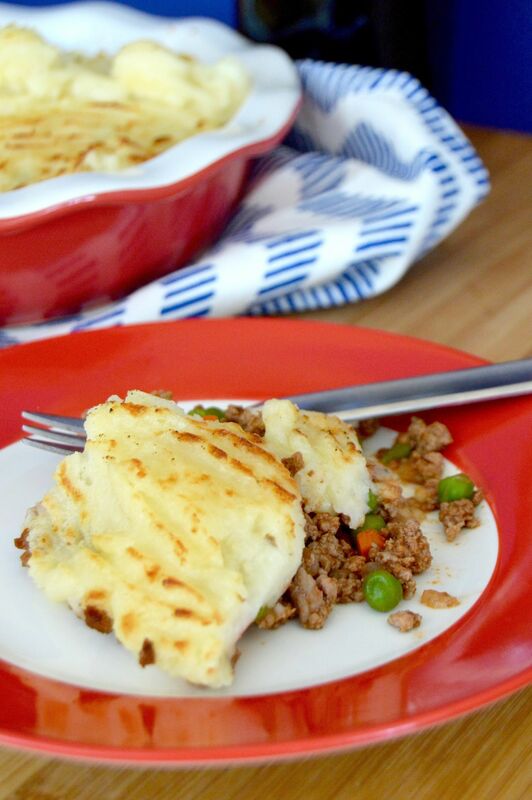 This shepherd’s pie takes comfort to a new level – I mean, Gouda?! forgettaboutit. YUM!!!! OMG I love the idea of lamb. Time to make my first Shepherd’s pie! My husband will plotz. His mom was British.